To get a more confident You in the coming year — or a more confident company, community, family, or team — first know what gets in the way. The best resolutions will go nowhere without the confidence to stick with them. Confidence is an expectation of a positive outcome. It is not a personality trait; it is an assessment of a situation that sparks motivation. If you have confidence, you’re motivated to put in the effort, to invest the time and resources, and to persist in reaching the goal. It’s not confidence itself that produces success; it’s the investment and the effort. Without enough confidence, it’s too easy to give up prematurely or not get started at all. Hopelessness and despair prevent positive action. Self-defeating assumptions. You think you can’t, so you don’t. A British Olympic runner is so rattled by a misstep that cost her a contest that she dropped out of the next. A company team decides that a popular world leader is so far out of their league that they don’t issue an invitation to speak at their customer event. Talented women sometimes “leave before they leave,” as Sheryl Sandberg puts it, assuming that they won’t be promoted (or succeed when they have children) so they start behaving like they’re departing years before departure, thus foreclosing their options. It’s one thing to be realistic, it’s another to behave like a loser before entering the game. Goals that are too big or too distant. I know how often leaders say they want to tackle BHAGs — “big hairy audacious goals.” But having only enormous goals can actually undermine confidence. The gap between a giant goal and today’s reality can be depressing and demotivating. Confidence comes from small wins that occur repeatedly, with each small step moving you closer to the big goal. But the small steps must be valued and turned into goals themselves. Winners think small as well as big. Declaring victory too soon. This is the dieter’s dilemma: lose the first few pounds, and feel so good that you reward yourself with chocolate cake, and when the pounds go back on, you feel so discouraged that you have more cake to feel better. I saw this pattern in a college football team that was coming off a 9-year losing streak (yes, 9 years!). After winning the first game in nearly a decade, a team member shouted that now we’ll win the championship. First, of course, they had to win the next game — which they didn’t. Step-by-step discipline builds confidence. Do-it-yourself-ing. It’s a trap to think you can go it alone, without a support system and without supporting others. Losing teams have stars, but they focus on their own records, not how well the whole team does; the resulting resentments and inequalities provoke internal battles that drag everyone down. To build your confidence, think about building the confidence of others and creating a culture in which everyone is more likely to succeed, whether through mentoring them or recognizing their strengths. Giving to others boosts happiness and self-esteem, as numerous research studies show. Supporting them makes it easier to ensure that they support you. Blaming someone else. Confidence rests on taking responsibility for one’s own behavior. Even in difficult circumstances, we have choices about how to respond to adversity. Whining about past harms reduces confidence about future possibilities. When the blame game is carried out within companies, everyone loses confidence, including external stakeholders. Confidence is the art of moving on. Defensiveness. It’s one thing to listen and respond to critics; it’s another to answer them before they’ve done anything. Don’t defend yourself if you’re not being attacked. Apologize for your mistakes, but don’t apologize for who or what you are. Instead, take pride in where you’ve come from and lead with your strengths. Neglecting to anticipate setbacks. Confidence involves a dose of reality. It is not blind optimism, thinking that everything will be fine no matter what. Confidence stems from knowing that there will be mistakes, problems, and small losses en route to big wins. After all, even winning sports teams are often behind at some point in the game. Confidence grows when you look at what can go wrong, think through alternatives, and feel you are prepared for whatever might happen. Over-confidence. Confidence is a sweet spot between despair and arrogance. Don’t let confidence slip over into the arrogant end. 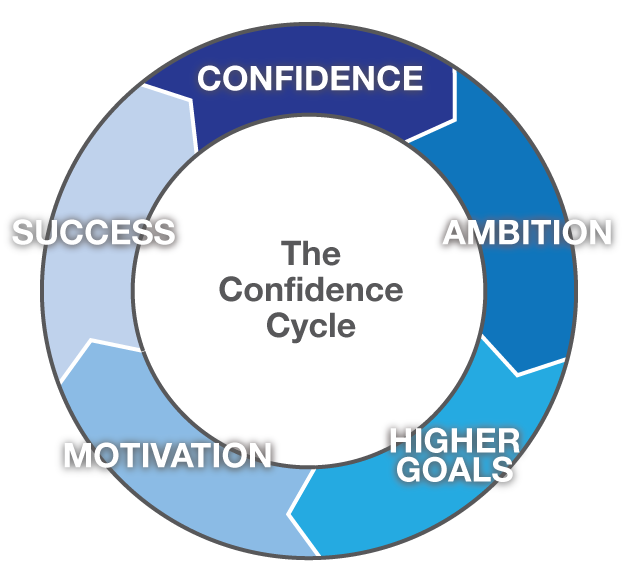 Over-confidence is the bane of economies (e.g., the irrational exuberance that preceded the global financial crisis), corrupt leaders (who assume they’re so necessary that they won’t get into trouble for a small expense account fudge), or individuals who swagger and feel entitled to success rather than working for it. Arrogance and complacency lead to neglect of the basics, deaf ears to critics, and blindness to the forces of change — a trap for companies as well as individuals. Sure enough, like the old proverb that “pride goeth before a fall,” the slide into a losing streak often begins with a winning streak. A little humility goes a long way to moderate arrogance and keep just the right amount of confidence. Remember, it’s not enough just to feel confident. You have to do the work. But with an expectation of success, you can try new things, form new partnerships, contribute to shared success, and revel in small wins that move you toward bigger goals. Are You Over-Preparing For Your Interview?